1. Through a book store. If not in stock, it can be ordered from the University of North Texas Press. The non-discounted price will be approximately $39.95 plus tax and shipping if purchased on the internet. 2. Directly though me. I’m making the book available for $30.00 plus $2.50 for mailing costs. If anyone wishes to purchase it from me directly, this will save about $10 off retail. I’ll also sign and note each book purchased through me. Here’s what one reader had to say: I served in the MRF as a 50 Cal. machine gunner in 1968-69, First on ATC-91-13 and later I manned a twin 50 Cal. on ASPB-92-4. I can easily recall many moments of fear, terror, anger, etc. 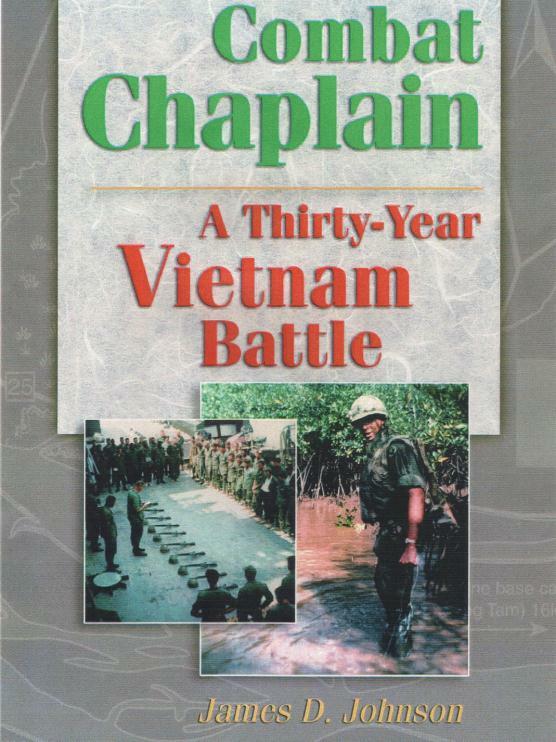 I recently ordered the new book by Dr. James Johnson “COMBAT CHAPLAIN: a 30 Year Vietnam battle”. Jim was kind enough to sign my book and I already cherish his kind words. I just want to offer the following comments on this book and author: Dr. Jim Johnson served right alongside his troops and experienced all the hardship and pain of combat in the harsh and unforgiving jungles of Vietnam. He loved his fellow soldiers. He laughed with them, cried with them, and often held their hand as they drew their last breath some 12,000 miles from home. Now, 30+ years later, with much work and compiling of notes, he has been able to put into words what very few people can. This Author’s descriptive abilities, compassion for others, and love for his soldiers is unmatched. Dr. Jim Johnson’s words bring out all the emotions one can possibly experience in reading a book. 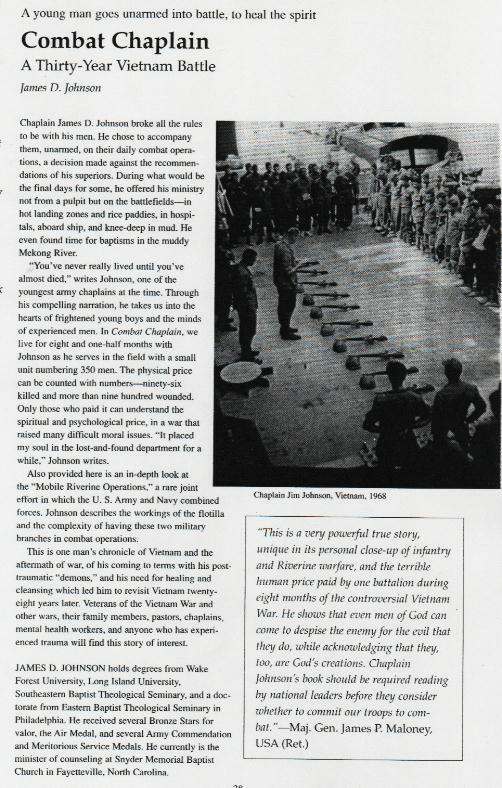 This book “COMBAT CHAPLAIN: A thirty year Vietnam Battle” should be classified as a “must read” for – teens and adults, civilians and military, and for ALL combat veterans. Take it from an ole “River Rat” (’68-’69), this book is ACCURATE, its TRUE, and it’s as REAL as it gets. I enjoyed Jims book so much, that I’ve purchased 11 copies so far, mostly as gifts to special loved ones (family and friends) who mean a great deal to me and who did those special loving things, while I served in Vietnam. I feel as each of them read this book, they will come closer to experiencing Vietnam than through any previous TV program, movie, or written word.